Located on the southern slopes of the Mendip Hills in a designated Area of Outstanding Natural Beauty and nestling in the grounds of the owners home yet where privacy is assured. This stylish barn conversion offers a great base for Glastonbury and Wells being within easy access of many attractions. It is also within easy reach of the Glastonbury Festival site. Great shopping destinations nearby Kilver Court Mulberry Outlet & Clarks Village are all a short drive away. Cribbs Causeway in Bristol is also only a 40 minute drive. The spacious accommodation is all on one-level. On entering the light and airy property through the large patio doors you will find yourself in the open-plan lounge/kitchen/dining room. (access can also be through the main bedroom) The feeling is space is only added to by the vaulted ceiling with exposed beams giving a real character feel with all the modern essentials required to enjoy your stay. 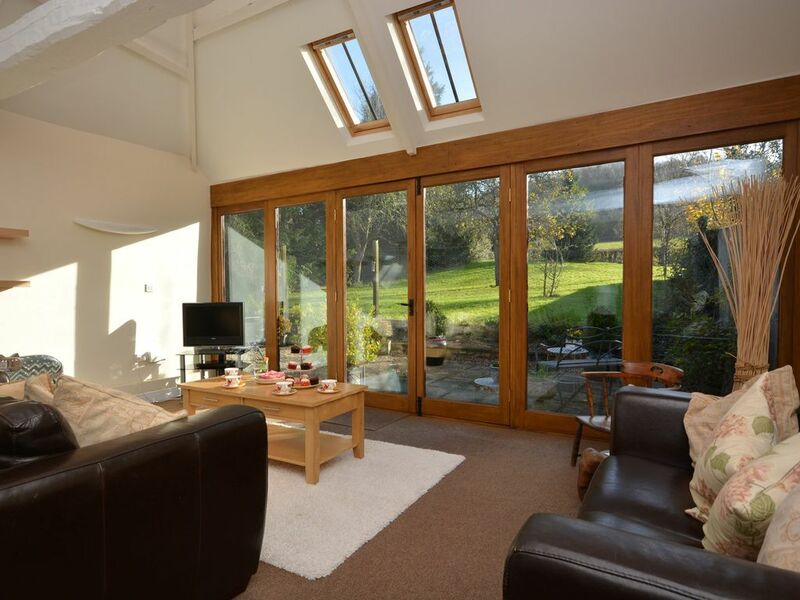 The lounge area is beautifully presented with large doors to the patio//garden area with TV/DVD player. Kitchen area electric over and hob microwave and fridge. (washing machine and tumble dryer can be found in a separate utility room) Dining area with large table ideal for family meals or playing board games of an evening in. Leaving the open-plan living area you will find yourself in the very large master bedroom with a super-king size bed. (which can be made up as a twin on request) There are velux windows in the ceiling and large feature window allowing plenty of light in to enjoy breakfast in bed. Through the far door you will find yourself in the entrance hall with access into the second bedroom with a double bed that looks out onto the garden and can have a cot put in on request. From the entrance hall you will also find the shower room with shower and WC. Venturing outside of the patio doors you will find an enclosed patio and garden area with garden furniture and a BBQ perfect for a glass of wine and al fresco dining after a long day of exploring. There is also a further paddock area with a football goal where children can play. There is ample parking off-road parking at the property and even a secure storage area for bicycles and motorcycles opposite the property. Dogs are charged at £20 per dog per week.